Willie Lee Simmons, Jr., (also known to family and friends as "Daddy" "Big Daddy," "Junior," "Uncle June," "Uncle Willie") a native of Toddtown, AL and a resident of McIntosh, AL was born to the parentage of the late Willie Lee Simmons, Sr. and the late Lillian Todd Simmons on November 3, 1943 in Clarke County, AL. Willie accepted Christ as his savior in October, 1971, at Pine Capel Baptist Church No. 2 under the leadership of Rev. Frank B. Dean. After moving from Toddtown, he united with St. Union Baptist Church of McIntosh, Al under the leadership of Elder Al-Clyde Saul's. In September, 2016 he reunited with Pine Chapel under the leadership of Rev. 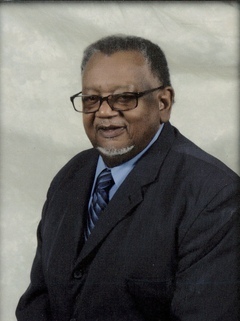 Allen Barnes, Jr. He attended regularly until his health began to fail. For thirty-five years, Willie was an employee of BASF, "Ciba-Geigy" in McIntosh, AL serving as a chemical operator technician. He dearly loved that job! If you wanted to strike up a quick conversation with him, just mention Geigy, and it was on. He often bragged about the diamond ring and other awards he received while working there. He retired in 2002. On April 9, 1966, Willie was united in Holy Matrimony to the love of his life, Bessie Lee Allen. To this union two daughters were born: Sharmilla Yolette and Natalie Bene'e. Willie's formal education was from Belsaw Elementary School in Mt. Vernon, AL and Wilson Hall High School in Grove Hill, AL. At Wilson Hall, he was a football star and played half-back position. Willie was one who showed himself friendly and thus had many friends. He was free spirited and enjoyed life to the fullest, seemingly letting nothing bother or worry him. After a brief illness, Willie answered the Heavenly Father's call to enter into rest on Friday, December 14, 2018 at 2:02 p.m. in his daughter's and son-in-law's home, Natalie and James Coleman. Willie was preceded in death by his parents and only sister, Barnette Chapman Reed. He is survived by one son, William Lenard Simmons of Mt. Vernon, AL; two loving and devoted daughters, Sharmilla (Willis) Sands of Detroit, MI and Natalie (James) Coleman of Toddtown, AL; seven grandchildren: Adrean, Christian, Aaron, Caleb, James, Jr., William , and Sharmilla; one brother, Henry (Daisy) Simmons of McIntosh, AL; two step brothers, Elder Nathaniel (Patricia) McLain, Jr., and Walter McLain both Mobile, AL; one step sister, Lula Adams of McIntosh, AL; one aunt, Inez Whiting of Pensacola, FL; seven nieces, seven nephews; two devoted- Leo Reed, Jr., and Brett Riley; twelve first cousins; three brothers-in-law; four sisters-in-law; numerous other cousins and many, many friends, two special: Joe (Cindy) Woods of Hartselle, AL, and Audrey Mae Hollinger of Mobile, AL.